The result of significant investment in innovation, research and development, Rosmiman IWMS Global Site is the natural evolution of traditional CMMS and CAFM Rosmiman systems. Integrated into one product, ROSMIMAN® IWMS Global Site features more functional, operational and technological processes in accordance with the integrated workplace management system as defined by Gartner. ROSMIMAN® IWMS Global Site is a comprehensive and collaborative system for managing real estate assets. It offers different users, such as owners, tenants, professional and technical managers, the ability to interact with the system from anywhere at any time, thanks to its easy to use, innovative software system. Fully customizable, ROSMIMAN® IWMS Global Site can manage anything from a simple project to large real estate assets located throughout the world. ROSMIMAN® IWMS Global Site incorporates the latest technologies to improve the efficiency and productivity of the system. Adaptability We align ourselves with your internal and global strategies to help your business innovate and increase collaboration. 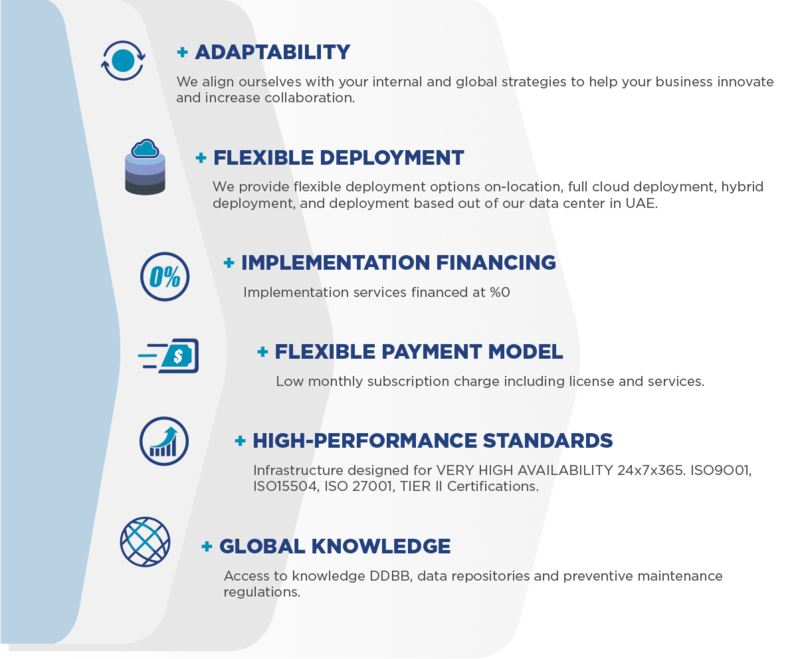 Flexible Deployment We provide flexible deployment options on-location, full cloud deployment, hybrid deployment, and deployment based out of our data center in UAE. Implementation Financing Implementation services financed at 0% Flexible Payment Model Low monthly subscription including license and services High-performance Standards Infrastructure designed for VERY HIGH AVAILABILITY 24x7x365. ISO9O01, ISO15504, ISO 27001, TIER II Certifications. Global Knowledge Access to knowledge DDBB, data repositories and preventive maintenance regulations.